Online courses can teach you a new skill, enhance what you already know, and even help you carve out a completely different career path. That’s why I’m always quick to recommend online courses to remote job seekers who need a little help on their quest to cubicle freedom. This is especially true for beginners who feel they don’t have the right skills, knowledge or experience to launch a remote-friendly career. But online courses can be a huge investment of both time and money. As such, you don’t want to find yourself in a position where you purchased a course only to learn it’s not right for you. 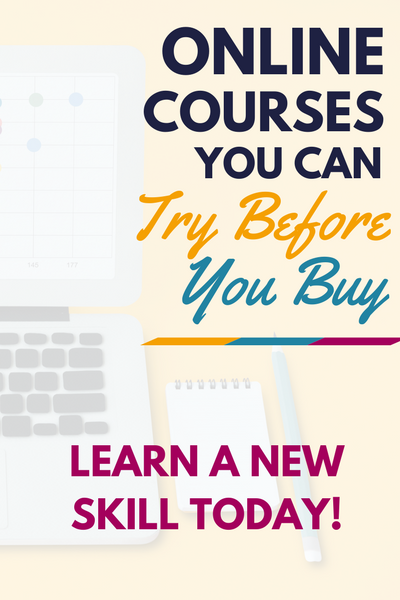 Fortunately, there are a number of online courses you can try before you buy! These mini courses give an introduction to what you can expect in the full course and help you understand what you’re getting into — before you get into it. So, if you’re ready to kick your cubicle to the curb but aren’t sure which direction to take to get you there, consider taking one (or all!) of these free online courses to help you figure out which work from home career path is right for you. The average virtual assistant (VA) earns more than $20 an hour. As an affordable alternative to an in-office assistant, VAs are hugely in demand. Bloggers, small business owners, and busy professionals turn to VAs to help them get more done in a day. At any given time, there are roughly 1 billion (yes, billion) websites in existence. That amounts to a lot of online content — blog posts, articles, web page copy, product descriptions, dating profiles, and so much more. All this content needs to be written. But not all website owners, bloggers, and marketers have the time (or skill) to write it. Instead, they opt to outsource the work to freelance writers. That’s where you come in. Fact: Amazon is the largest online retailer. You can grab a slice of the multi-billion dollar pie by becoming an Amazon seller — and it’s a lot easier than you may think. Thanks to Fulfillment by Amazon, commonly called Amazon FBA, you can start selling on Amazon without having to worry about shipping orders on demand, customer service or keeping track of sales. Did you know that Entrepreneur named bookkeeping as the most profitable business? It’s true. And because you can do all the duties of a bookkeeper without maintaining an out-of-the-house office, it also happens to be a super remote-friendly business to launch. As a bookkeeper, you can earn an average of $60+ per hour. And you don’t need any previous experience of knowledge to get started. Are you a self-proclaimed member of the Grammar Police? Do you spot spelling mistakes on everything from cereal boxes to circulars? If so, you’d probably make a great proofreader. As with any service-based business, I always recommend picking a niche, and proofreading is no exception. One such niche in the proofreading world is for court reporters! This lucrative (and interesting) career path can be done from virtually any location, making it perfect for digital nomads. In fact, Caitlin Pyle earned more than $40,000/year proofreading for court reporters using her iPad. And she’s teaching you everything she knows so you too can kick your cubicle to the curb. Who hires general transcriptionists? You’d be surprised to learn that everyone from bloggers to online marketers and ebook authors use transcriptionists — and that’s just a short list! Legal transcription is more specialized than general transcription. Where general typists can work on a wide variety of files including market research, entertainment, and finance, legal typists have a much more narrow focus. Depositions and recorded interviews are two common types of files legal typists handle. If this is new territory for you — don’t panic! You can learn the skills needed to become a successful legal transcriptionist with the help of online courses. We already looked at the possibility of becoming a transcript proofreader. But before a transcript goes to a proofreader, it needs to be edited. This process is officially called scoping. This unique at-home career offers big earning opportunity without needing a college education. In fact, you can learn everything needed to be successful by taking an online course. Start for free over a Internet Scoping School to find out if you have what it takes! Are you the creative type? Do you have a hobby like art or photography you want to use to create your own cubicle-free career? You can! And Skillshare has the bite-sized online courses you need to get there. From graphic design, freelancing, blogging, handmade artistry, and more, Skillshare is the place for creatives to learn a new skill. You can try it free for 30 days and, in that time, learn so many new things. In fact, with the short, actionable courses, you can learn a new skill every day. It never hurts to learn a new skill. Today, learning doesn’t end when you graduate. With changing technology and ever evolving virtual workplaces, you need to keep up to set yourself apart from the competition. Fortunately, there are a number of online courses you can take to keep your existing knowledge fresh and learn new skills that make you a standout remote worker. So, what are you waiting for? Go ahead and sign up for one of the free online courses today. You won’t know if it’s right for you until you try! Let me know in the comments which one you chose. P.S. This post contains affiliate links. What are they and how do I use them? Check out my disclosure statement for more information. The post Online Courses You Can Try Before You Buy appeared first on Work from Home Happiness. Next Small Business Investment Returns Astronomical?